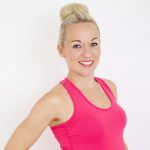 In my last column I gave fitness tips for summer brides-to-be and today I’m following on with a video which shows five exercises that help to give the toned look to arms, shoulders and upper back. Without a doubt one of the areas that is of most concern to the majority of women preparing for their big day is their arms as almost all dress styles will result in the arms showing. It was certainly a concern of mine when I was preparing for my own wedding. To do some of these exercises you will need a resistance band of low to medium resistance. You can buy a resistance band in most good sport shops or supermarkets. The exercises that I’ve chosen in this video will help to target all areas including the front and back of the arms, the shoulders and the upper back. As with all exercise you should make sure to warm up and stretch beforehand and stretch again afterwards.